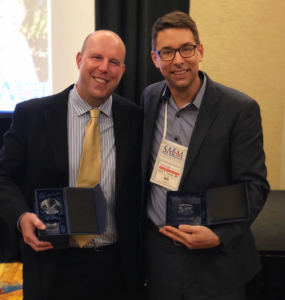 Janis Tupesis, the Global Health Institute’s graduate medical education liaison, received the 2018 Presidential Lifetime Achievement Award from Global Emergency Medicine Academy (GEMA) of the Society for Academic Emergency Medicine (SAEM). GEMA presents the award annually to an individual who has improved the delivery of emergent/acute care the world-over through service, leadership, mentorship and academic endeavor. To be eligible for the award the individual needs to be an active Society for Academic Emergency Medicine member, GEMA member and have 10 years or more of global health experience. Tupesis, an emergency physician and former UW-Madison Emergency Medicine residency director at the UW-Madison School of Medicine and Public Health, completed his residency training at the University of Chicago Hospitals and Clinics and received his medical degree from UW-Madison. Tupesis also works as a volunteer technical consultant at the World Health Organization’s Emergency, Trauma and Acute Care program and serves as the chairperson of the Graduate Medical Education Global Health committee at the UW-Madison Hospitals and Clinics. During his career, Tupesis says he has focused on bilateral collaboration and partnerships, which he have led to the development of education training programs, curricula and international partnerships. 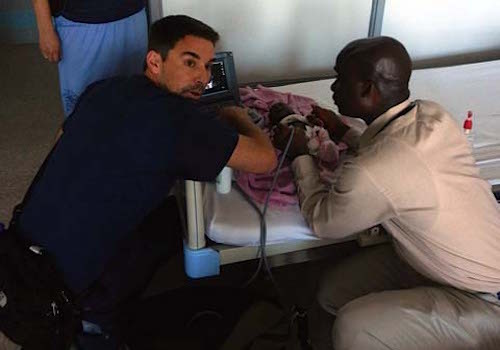 Currently, Tupesis is working to further develop graduate medical education programs in Liberia, Ethiopia and South Africa that integrate global health into their training. Tupesis emphasizes the significance of completing a residency rotation abroad and the different perspective it gives students. To help medical students safely and effectively participate in international rotations, Tupesis helped develop “The Practitioner’s Guide to Global Health,” an online, open-access course. The three-part course gives students resources and information about what they should expect from a global health rotation, how to properly prepare for the trip and tools to prepare for their return. Tupesis has also worked on projects focusing on the intersection of education, health systems and technology, such as creating an app designed to give doctors critical information when they need it. Thanks to a 2015 GHI Seed Grant, Tupesis and his colleagues in South Africa were able to develop the “Essential Medicine Guidance” app and introduce it in the Western Cape province in July 2016. After a month, emergency health care providers were using it regularly to access information such as what medicines are available and hospital’s clinical guidelines to manage specific conditions.